Its a new year again! I started 2018 full of excitement and with lots of plans. But then I fell pregnant and as a result everything else was pushed aside a bit, including writing blog posts. Sorry about that, but with this being my last pregnancy, I am made sure to “enjoy” every moment of it, even the all day sickness…. Little C was born at home on the 2nd of November after a super quick 30minute labour. I have been (and still am) enjoying all the newborn cuddles I can get. He is now just over 2 months old and I am starting to be able to steal a moment or two here & there to spend on here. I managed to make all the maternity wear I needed for this pregnancy as well as 2 sets of breastfeeding pajamas. With my previous babies I just used normal pajamas, but let me tell you, these are a game changer. Little C got quite a few mommy-made outfits and has been rocking them on his cute cloth bum. I hope to do a roundup post of all the items I made in 2018 soon. 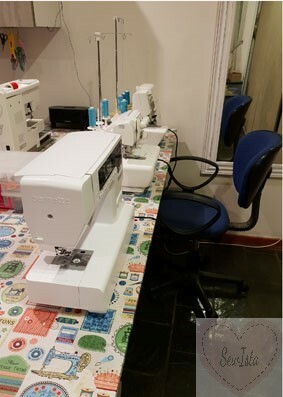 I have managed to clean up my office/sewing room and look forward to start sewing up some awesome new items soon. For the year ahead, I have big plans. Including some new fabric bases, new colours in our hand dyed range and a whole new range of products which will hopefully be added to the website soon. I know I have been slow in replying to some of your queries, and I apologise but who can say no when this cutie pie wants you to hold him the whole time? May your pins always be sharp and your bobbin thread never run out! I make use of Affiliate Links on my site. These are products I use / recommend. If you make a purchase after following the link from my site, I will get a small commission at no extra cost to you. Thank you for supporting my Affiliates and helping me fund the website. We are Located in South Africa and currently only offer shipping in South Africa. International customers will be responsible for arranging their shipping.